Rotherham United’s game at the bet365 Stadium on Saturday will see Andy Woolmer from Northamptonshire in the middle. 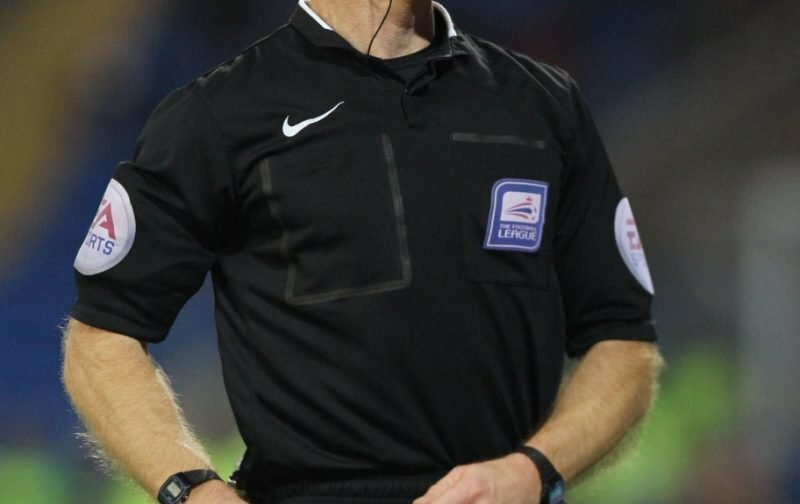 Andy has been on the National List of Referees since 2004 after coming through the UCL and Southern League to get there. He was an assistant for ten years, including three in the Premier League, and his major appointments include the FLT Final, FL Cup Final and the Community Shield. Andy was last in charge of the Millers on a cold Tuesday night in November when Queens Park Rangers were the visitors to the New York Stadium. Will Vaulks put the Millers in front on six minutes but a twelfth minute goal from Nahki Wells pulled Rangers level. Clark Robertson put the hosts in front again on fifteen minutes but the Millers couldn’t hold on and a goal in injury time from Luke Freeman gave the visitors a point. On Bonfire Night 2016 Andy was at the New York Stadium when Jordan Hugill and Callum Robinson put Preston North End two up inside the first half-an-hour. Richard Wood halved the deficit with twenty minutes to go but a goal ten minutes from time from Marnick Vermijl gave the visitors a three-one win. The time before that when Andy was in the middle for a game involving the Millers was in the January in the FA Cup at Elland Road. Mustapha Carayol scored on the stroke of half-time with Souleymane Doukara getting a second on the stroke of full-time. In the September 2015 Andy was in charge of our first away win of the season which was at Birmingham. Matt Derbyshire and Tony Andreu scored the Millers goals that day and there were no cards shown. The time Andy was in the middle of a Rotherham game before that was when we were in League One. The game was at the New York Stadium in March 2014 when Walsall were in town. Milan Lalkovic put the Saddlers in front on nineteen minutes but things went pear shaped for the visitors on the seventy-third minute when Ben Purkiss was shown a second yellow card for impeding Ben Pringle and went for an early bath. Minutes later Nicky Adams came off the bench to make an extra striker and with just a minute to go Kieran Agard put him through and his shot deflected off defender Andy Taylor, onto the bar and bounced into the net to give the hosts the equaliser. Earlier that season Andy officiated over our four-one win over Gillingham again at the New York Stadium. Nouha Dicko, Kieran Agard and Ben Pringle gave the Millers a three-nil lead going into half-time with Cody McDonald pulling one back on sixty-six minutes. But a goal ten minutes later from James Tavernier gave the Millers back their three goal cushion and all three points in a game which saw no cards shown. In February 2012 Andy was in charge of our away game against Gillingham on a cold Tuesday night which saw fifty-seven brave Millers make the journey down to the Priestfield Stadium. The game ended nil-nil which was the Millers fourth undefeated game in a row. Friday 14th October 2011 saw the Millers away at the Memorial Stadium when Andy was in the middle. Scott McGleish put Bristol Rovers in front on ten minutes and doubled the score when Johnny Mullins challenged Scott Rendell in the area and Mr Woolmer gave a penalty which McGleish scored from. Three minutes later Cian Bolger made it three-nil for the home side but a goal from Jason Taylor on thirty-seven minutes gave the Millers a life-line. Six minutes into the second half Danny Schofield made it three-two but four minutes later Guy Branston, who had re-joined the Millers on loan just that morning, was shown a straight red for a terrible two-footed challenge on Stuart Campbell. From the resulting free-kick Lee Brown made it four-two to the hosts with Joe Anyinsah making it five-two just before the end of the game. Later that season Andy also officiated at our goalless draw against Gillingham at Priestfield Stadium. A hat-trick from Chris Dagnall in the last nine minutes of the game added to an earlier goal from Gary Jones gave Rochdale a four-one win over the Millers when Andy was in charge at Spotland in March 2008. Marc Joseph scored for Rotherham on seven minutes. The first time Andy was in charge of a Millers game was in October 2005 at the National Hockey Stadium when the Millers drew with MK Dons one-all. The game was a scrappy affair and Andy Monkhouse put the Millers in front on twenty-four minutes which started with a Shaun Barker long throw. Ten minutes from time Malvin Kamara got the Dons’ equaliser. There were five bookings that day – Pablo Mills and Dean Lewington from the home side and Paul McLaren, John Mullin and Monkhouse from the Millers. Andy has been in the middle for twenty-five games this season showing seventy-seven yellow cards and four red cards. Running the line on Saturday we have Dean Treleaven and Billy Smallwood with Peter Bankes acting as Fourth Official.